Once, when the older brat was two years old, I was visiting relatives in Delhi and came across a bubbly young lady who was thrilled at having won a very special gift hamper. It turned out that her son, also two, had just been judged ‘Best smile” baby in a Healthy Baby Competition he (or rather she) had participated in. My eyes had almost popped out of their sockets. Did such competitions still exist? Weren’t they rather regressive, pitting one baby over another purely on the basis of their looks and if I may add, chubbiness? I may have dismissed Mommy Best Smile and her competitive streak but did wonder for a split second if the boy would have made the cut. You see, competition is like that ad for Rin soap. You may not be a participant but you can’t help but wonder- Bhala uski kameez meri kameez se zyada safed kaise? Especially if you have children. Last week, the son’s Karate organisation had a competition. I kept him out of it as it fell on a day when we had prior engagements and mainly because he wasn’t much interested. But I also wondered if I had committed some parenting faux pas by letting him avoid it and not egging him on like the good mothers in Bournvita ads. Then I thought, he’s six. There will be enough competitions all throughout later in life. More importantly, I decided to change channels during the Bournvita ads. Jokes apart, there is something like ‘healthy competition’ also, but many people would call it an oxymoron. "A little amount of pressure is good," says clinical psychologist Anupama Rajagopalan Shah, "It makes people want to do their best." The trouble, Anupama thinks, arises when the pressure to excel becomes so much that kids end up compromising on their sleep, rest and free time. Anupama, who has two and half year old twin daughters of her own, feels competitions are best avoided until children are at least six. "As they grow older they understand that there is something happening in terms of group activity and they want to do well." But what if your child is not ready? My friend Arshia Das had a tough time trying to convince her son to participate in a skating competition. "I thought he was good at it, and so did his coach. But he was just not interested as he had school projects to complete. Eventually, I let it be." Anupama thinks children generally tend to say no but as a parent you need to explain and expose them to things as much as you can to see if they like that activity/competition or not. But she also warns parents against forcing a child who comes across as repeatedly disinterested or majorly upset about having to take part. Listen to your child, she says, especially once they are older and able to express themselves. Arshia agrees. "It took me some time to convince myself that my son is eight and knows his mind and to accept that. He completed his project and he’s ready to take part in the next skating competition once it comes up." 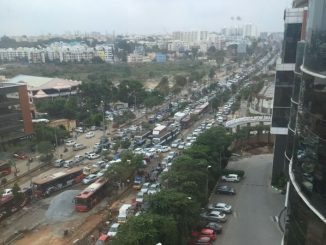 There is no respite from traffic pile ups on Bengaluru’s Outer Ring Road. Sometimes it’s rain, sometimes it’s bus breakdown. Does the government have the will to to fix it? Lead, a brain poison, is a serious childhood health risk; And Bengaluru residents seems to be quite vulnerable to lead poisoning.